This is such a cute cape babe!! I love that you cinched it off with this gorgeous belt too. Gives me major style inspo! Great outfit idea here! It’s a great classic print. I love how it looks with your belt too! I recently bought a blanket scarf but didn’t know how to wear it. Wearing it like a cape as you did is a great idea! I love how you styled this! It looks so cute on you! Sooo cute! I love the one you’re wearing – it’s neutral and matches everything! OK this is the best way I’ve ever seen a plaid cape styled! With that gorgeous Hermes belt! You totally rocked this look so perfectly! Love it! Such a cute idea and a perfect little hack for holiday parties! Loving the plaid! 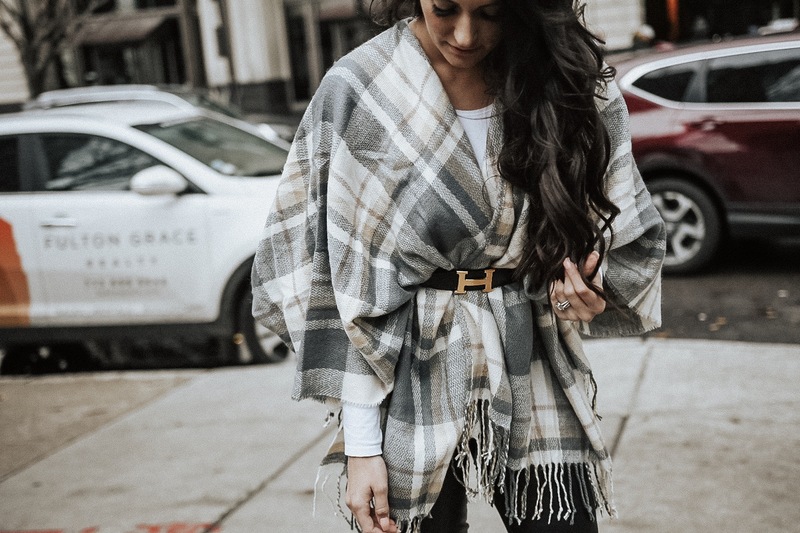 I love wearing blanket scarves like this! SO cute. This cape is so fab, but the way you cinched it with that belt is perfection! I love it! This cape is amazing on you!! So chic as always!! I love the one you are wearing and how you belted it is seriously so perfect! So many great options you shared! Love a good cape this time of year! Also all about belting them to make it look so much more chic and put together. OH so chic and I love that belt! I love how you wore yours! You are always slaying the super fly looks with such ease girl! Love it!